Offering you a complete choice of products which include duct leakage testing and ac grill. Why Is Duct Leakage Important? 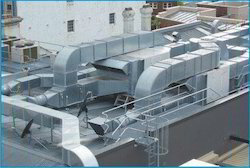 Leaks in forced air duct systems are now recognized as a major source of energy waste in both new and existing Buildings. Studies indicate that duct leakage can account for as much as 25% of total energy loss, and in many cases has a greater impact on energy use than air infiltration through the building shell. Just as important, duct leakage can prevent heating and cooling systems from doing their job properly, resulting in hot or cold rooms, and humidity problems. Worse yet, duct leaks can create air quality problems by pulling pollutants and irritants directly into the building.Pinpointing Leaks with a Smoke MachineIn the last few years, energy consultants have developed a quick and easy way to pinpoint air leaks in a building envelope. The technique uses a smoke machine creates smoke-like fog. Builders/Air Conditioning Contractors use non-toxic smoke (fog) to find envelope holes. Once a smoke machine has clouded the interior of a pressurized building, A/C contractors can find envelope leaks by looking outdoors for the escaping fog.Smoke/fog machines can also be used to test for duct leaks. Sometimes you may be working with an HVAC contractor who says, ‘This is a good duct system. This is the way we have always done it. This is normal.’ When you show them the fog coming out of the leaks, they shut up really fast. available in rectangular, square or as per your requirement. Looking for “Industrial AC System”?